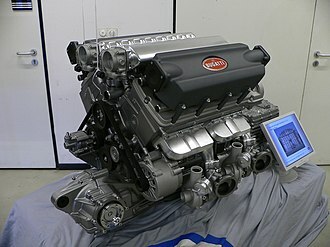 The F140 engine family is a series of 65° DOHC V12 petrol engines produced by Ferrari since 2002, and used in both Ferrari and Maserati cars. 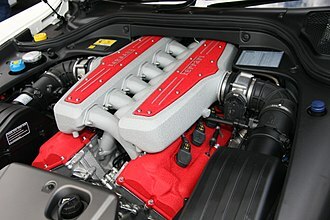 This engine was derived from the already extant Ferrari/Maserati V8. 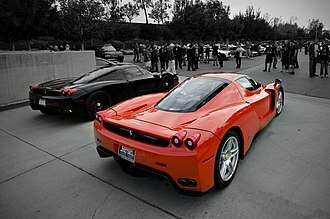 In the Enzo Ferrari, it set the record for the most powerful naturally aspirated engine in a road car. 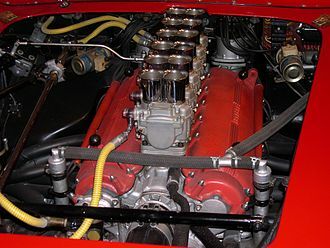 The 5998 cc engine, designed for the Enzo, is known within Ferrari as the Tipo F140B, whereas the very similar Tipo F140C engine displaces 5999 cc and was designed for the 599 as the most powerful series-production Ferrari engine, a trend that has continued with the F12 and 812. 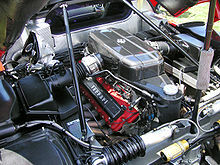 This engine is also used in Maserati Birdcage 75th. 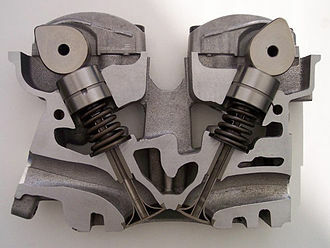 For Tipo F140EB displacement was enlarged to 6262 cc and debuted in FF. Latest enlargement saw Tipo F140GA at 6496 cc and is now used in 812. 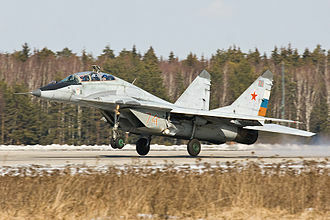 The F140 engine family has won a total of 6 awards in the International Engine of the Year competition. In 2013 the F140 FC V12 engine used in the Ferrari F12berlinetta was awarded "Best Performance Engine" and "Above 4.0 litre" recognitions. The F12tdf engine has won the "Above 4.0 litre" category in 2016 and 2017. 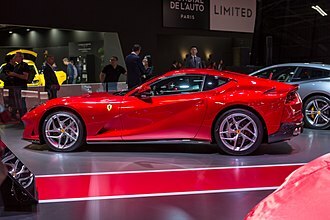 In 2018 the 812 Superfast powerplant was recognised as "Best New Engine" and gave Ferrari another "Above 4.0 litre" class win. ^ "International Engine of the Year Awards 2013". Retrieved 6 June 2013. The Ferrari F12berlinetta is a front mid-engine, rear-wheel-drive grand tourer produced by Italian sports car manufacturer Ferrari. The F12berlinetta, debuted at the 2012 Geneva Motor Show, replaces the 599 series grand tourers. The naturally aspirated 6.3 litre Ferrari V12 engine in the F12berlinetta has won the International Engine of the Year Awards 2013 in the Best Performance category, the F12berlinetta was named The Supercar of the Year 2012 by car magazine Top Gear. In 2014 it was awarded the XXIII Premio Compasso doro ADI, accepting the award was Ferrari’s Senior Vice President of Design, Flavio Manzoni. The F12berlinetta uses a 6,262 cc, naturally aspirated 65° V12 engine of the Ferrari F140 engine family. This allows the F12berlinetta to accelerate from 0 to 100 km/h in an officially reported 3.1 seconds,0 to 200 km/h in 8.5 seconds and a top speed of 211 mph. The engine of the F12berlinetta has been designed to be more efficient than that of the 599, the engine management system is fitted with Ferraris HELE start-stop system to reduce fuel consumption when idling. Ferrari reports that the F12berlinetta can achieve 18 mpg‑imp – a 30% improvement over the 599 –, compared to similar models, the F12berlinetta uses shortened gear ratios to match the power of the engine. The F12berlinetta is built around a space frame chassis co-developed with Scaglietti. The chassis is made up of 12 different aluminium alloys and improves structural rigidity by 20% over the 599, the centre of gravity has been lowered by around 25 mm. The F12berlinettas weight distribution is 48% front, 52% rear, the cars stability and traction control and other settings are controlled by the Manettino dial mounted on the steering wheel. The F12berlinetta is fitted with Michelin Pilot Super Sport tyres, with the tyre codes 255/35 ZR20 at the front, the F12berlinetta makes use of aerodynamic techniques based on Ferraris 599XX and Formula One programmes, developed with wind tunnel and CFD testing. A notable feature is the Aero Bridge, an air channel running from the bonnet, through the flanks and along the sides of the vehicle, creating an effect that increases downforce. The Ferrari FF is a grand tourer presented by Ferrari on March 1,2011 at the Geneva Motor Show. 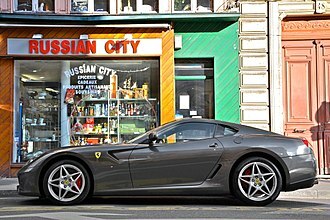 It is Ferraris first production four-wheel drive model, the body style has been described as a shooting-brake, a type of sporting hatchback/estate car with two doors. It replaced the 612 Scaglietti grand tourer, the FF has a top speed of 335 km/h and it accelerates from zero to 100 km/h in 3.7 seconds. 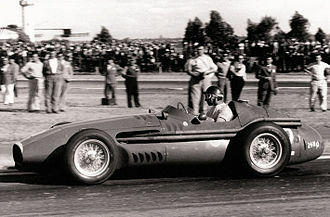 Ferrari states that the FF was the worlds fastest four-seat automobile upon its release to the public, the FF costs US$300,000, with 800 being produced during the first year. The FF is equipped with a 7-speed dual-clutch semi-automatic paddle shift system similar to the California, the 458 Italia, and the F12berlinetta. It functions only when the dial on the steering wheel is in the comfort or snow positions. 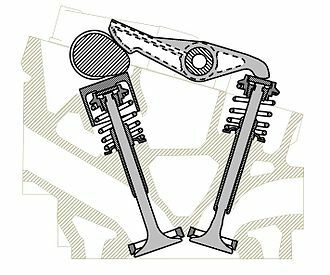 Ferraris first use of 4RM was in a prototype created in the end of the 80s and this system is based around a second, gearbox, taking power from the front of the engine. 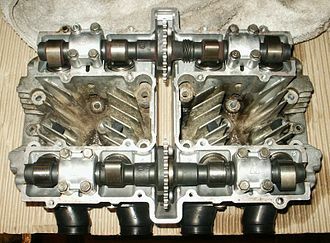 This gearbox has only two forward gears plus reverse, so the system is active in 1st to 4th gears. 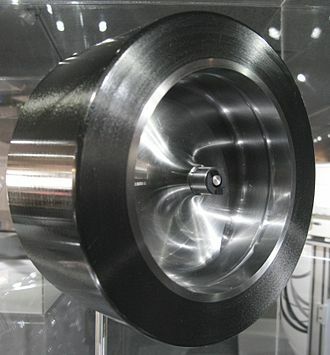 The connection between this gearbox and each front wheel is via independent haldex-type clutches, without a differential, due to the difference in ratios the clutches continually slip and only transmit, at most, 20% of the engines torque. A detailed description of the system has been published, the FF shares the design language of contemporary Ferraris, including the pulled-back headlights of the 458 Italia, and the twin circular taillights seen on the 458 as well as the 599 GTB Fiorano. Distinctive styling elements include a large egg-crate grille, defined side skirts, the shooting brake configuration is a departure from the conventional wedge shape of modern Ferraris, and the FF has been likened to the similarly-shaped 1962 Ferrari 250 GT SWB Drogo race car. The combination of hatchback-like shooting-brake design and collapsible rear seats gives the Ferrari FF a boot capacity of between 450 litres to 800 litres, car&Driver China magazine gives the FF the title of “Most Beautiful Super Car 2011” at Shangai Auto Show. LaFerrari is a limited production hybrid sports car built by Ferrari. LaFerrari literally means The Ferrari in most Romance languages, in the sense that it is the definitive Ferrari, on December 3,2016, a LaFerrari auctioned off for $7 million making this car the most valuable 21st century automobile ever sold at auction. LaFerrari Concept Manta, LaFerrari Concept Tensostruttura were unveiled in Ferrari Museum Maranello, the LaFerrari is based on findings from testing of the FXX and on research being conducted by the Millechili Project at the University of Modena. 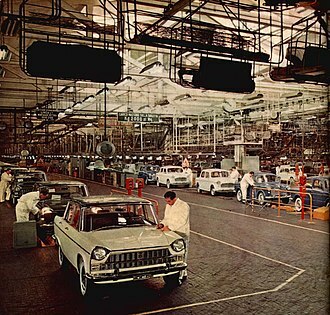 Association with the Millechili Project led to speculation during development that the car would weigh under 1,000 kg, only 499 units have been built, and each cost more than 1 million US dollars. An additional 500th car was made to be sold at an auction. 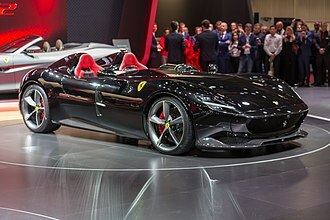 The vehicle was unveiled at the 2013 Geneva Auto Show, followed by Auto Shanghai 2013,2013 Tour Auto Optic 2000,2013 Supercar Chronicle, the LaFerrari Aperta is a limited version of the LaFerrari. 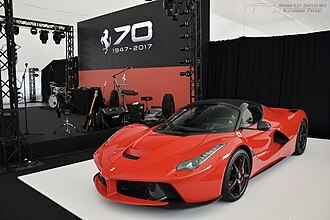 200 cars will be sold, the additional nine Ferrari LaFerrari are reserved for selected distribution during the 70th anniversary celebrations of Ferrari, the LaFerrari Aperta comes with a removable carbon-fibre hard top and a removable soft top. 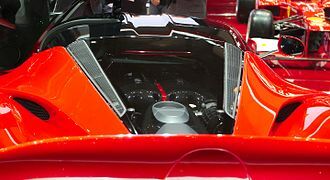 The vehicle was unveiled in 2016 Paris Auto Show, like past convertible Ferrari models, it may use the Aperta label to denote its retractable roof. According to Ferrari, all units have already sold to customers via invitation. LaFerrari is the first mild hybrid from Ferrari, providing the highest power output of any Ferrari whilst decreasing fuel consumption by 40 percent, the KERS system adds extra power to the combustion engines output level for a total of 963 PS and a combined torque of 900 N·m. 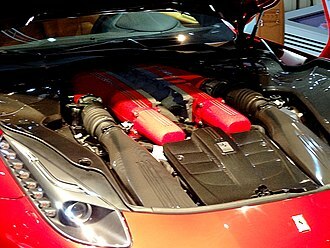 Ferrari claims CO2 emissions of 330 g/km, the engines bore and stroke is 94×75.2 mm with a compression ratio of 13.5,1 and a specific power output of 94 kW per litre. 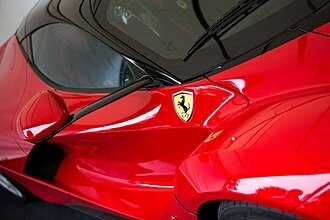 It is connected to a 7-speed dual-clutch transmission and the car is rear-wheel drive, Ferrari LaFerrari has a power to weight ratio of 1.3 kg per horsepower. The car is equipped with carbon-ceramic Brembo discs on the front and rear, with the car sitting on Pirelli P Zero Corsa tires measuring 265/30 R19 and it has a double wishbone suspension in the front and a multi-link suspension in the rear. Ferrari claims that the car has lapped its Fiorano Test Circuit in 1,19.70 which is faster than any other road-legal car Ferrari has ever produced. LaFerrari received no input from Pininfarina, making it the first Ferrari since the Bertone-styled 1973 Dino 308 GT4 not to have Pininfarina bodywork or other styling and this decision is a rare exception to the collaboration between Ferrari and Pininfarina that began in 1951. However, Ferrari has stated that two new models designed jointly with Pininfarina have yet to be unveiled and that there are no plans to end relations with Pininfarina. The cockpit stands out for its essentiality and the sportiness of the shapes, there is a steering wheel with integrated controls and gear levers directly fixed to the steering column, a solution that allows better use in all conditions. The Ferrari FXX is a high-performance race car and prototype built by automobile manufacturer Ferrari in Maranello, Italy. The FXX is based on the street-legal Enzo, production of the FXX began in 2005. The FXX uses some technology developed from the Enzo Ferrari, and combines it with new developments from Ferrari. However, the car is only a part of the overall program, customers pay £2 million, but are only allowed to drive the car on special track days which are approved by Ferrari. After they drive the car, the owners are entitled to be briefed by Ferrari on the cars performance, Ferraris sister company, has developed a similar car, the MC12 Corsa. It is suspected that Ferrari closely guards the FXX due to the car incorporating various advanced technology from Ferraris F1 team that the company does not want released to rivals. An evolution of the Enzo, in essence, the FXX shares some components with the original car, the FXXs engine is based on Enzos, but displacement has been increased to 6,262 cc from 5,998 cc. Output has been boosted from the Enzos 670 PS, to 820 PS at 8,500 rpm, the gearbox incorporates the latest developments from Ferraris F1 program and has a shift time of under 100 ms. 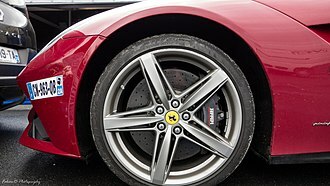 The brake pads were upgraded from the Enzo and it does, retain the Carbon fibre-reinforced Silicon Carbide ceramic composite discs found on the Enzo. The tires are custom-developed 19 inch slicks, Ferrari has built 30, adding one special edition to the 29 that were originally planned. The original 29 have all sold to pre-selected past Ferrari customers. The 30th was retained by Ferrari S. p. A. and presented to Ferraris F1 World Champion driver, Michael Schumacher, when he retired from Formula One racing at the end of 2006. Schumachers FXX differs from others in being black without a stripe, having red trimmed wheels, matte rather than chrome exhaust tips, FXX owners participate in Ferraris testing and brand development programs. As part of the FXX programme, the car is maintained by the Ferrari factory, the purpose of this particular program is to allow Ferraris top customers exclusive access to its most up-to-date technology and to utilize their input in the development of future models. The Maserati Birdcage 75th at the 2006 LA Auto Show. The Birdcage 75th, with the canopy open, at the same show.